As your baby gets older, up to about 2 years of age, she’ll still be sleeping 13-14 hours, but the amount of daytime sleep will diminish month-by-month. By age 2, your baby should be sleeping through the night with a 2-hour nap during the day. Again, this will vary by child. Your baby might need a slightly longer nap or two short naps. At this age though, try to discourage naps too late in the afternoon, as this can make it harder to get them to sleep a few hours later at bed time. If your child will to go to bed only if you’re around, she’s forming bad habit that will be hard to break later. The best lesson you can teach her is how to soothe herself to sleep. Follow a nightly bedtime routine (bath, books, and bed, for example) so she knows what’s expected of her and what to expect at night. You can tell her that if she stays in bed you’ll come back in five minutes to check on her. Let her know that she’s safe and that you’ll be nearby. (There are a variety of techniques that you can try- take a look at some of our other sleep related articles). 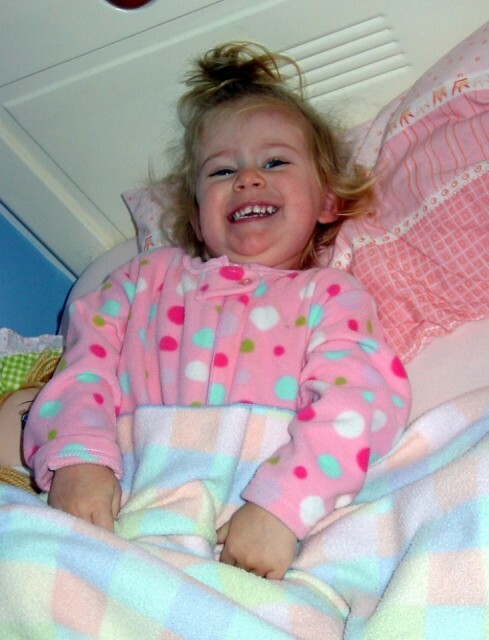 Toddlers are great negotiators, and they’re no different when it comes to bedtime. And because they so enjoy the time they spend with you, they’ll do what they can to prolong the time they have with you. Your child may take her time doing her usual bedtime routine, ask repeatedly for a glass of water, or keep requesting that you come to her room because she needs something. If you suspect she’s stalling, don’t let her. Tell her it’s time for bed and that she can finish working on her art project the next day or find the stuffed bunny the following morning. Make the nighttime routine more “business like” when you kiss your baby and tuck her in. Don’t wait around for your baby to fuss. Just leave and close the door and wait about ten minutes before you go back in the room. Sometimes it’s just a battle for control. Your toddler wants to control her environment as much as possible. You can’t force her to fall asleep. Try reverse psychology and tell her she doesn’t have to go to sleep, but can play in her cot. Eventually, she’ll fall asleep on her own.